Discover the historic and charming town of Amboise, while staying in 'Le Clos Fleuri', your cottage along the Loire, surrounded by a peaceful garden. Le Clos Fleuri is 2 minutes by car from the center of Old Town Amboise, on the Quai des Violettes, surrounded by gardens, with a terrace for relaxing to taste the local wines and delicacies found at the Amboise Open Market! Le Clos Fleuri cottage offers you the privacy of a full sized home (1000 square feet) surrounded by peaceful gardens (2000 square feet). There is ample parking for 3 cars, within the grounds of the property. The cottage is spacious with a fully equipped and modern kitchen, comfortably furnished living room/dining room, with 2 sets of glass doors opening directly onto its terrace. The main bedroom has an electric bed with controls to adjust each side to the perfect position, and double glass doors opening onto the terrace, overlooking the lush garden. The second bedroom also has a large double bed, and a double window with metal shutters. All windows have been recently replaced and are double-paned. The new sofa in the living room is convertible and transforms into another double bed = 3 beds total. The bright and modern bathroom has a shower and window. The WC is separate -- no waiting! The kitchen is fully equipped, and includes - cooktop, oven, microwave, fridge/freezer, coffee machine. There is also a dishwasher, and a washing machine. The cottage has been lovingly renovated with all new electrical system and updated plumbing. Of course Le Clos Fleuri is equipped with High-Speed Internet/Wifi, Cable TV, and a telephone that allows you to call Internationally for Free. Amboise, with its Royal Palace, Shopping district along the Rue Nationale, with its Clock Tower, clothing and antique shops, restaurants, wine tasting rooms, cheese shops, bakeries, bike rentals, etc. 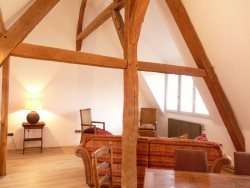 is minutes from your charming cottage along the Loire. The popular Amboise Open Market, along the Loire River, is held 2 days per week, and the Chateau Clos Luce, the last home of Leonardo da Vinci, now a museum in his honor, is worth a look. After a day of visiting the quintessential Chateaux of the Loire Valley, you will have the pleasure of returning to your Amboise chez-vous, with secured, and gated off street parking, and make a meal in your modern kitchen, to be enjoyed on your terrace! Or, you might decide to visit one of the endless restaurants, bistros and cafés that line the Place du Chateau, the Rue Nationale, the Loire River or on the amazing island, Île d'Or, off the Amboise bridge in the middle of the Loire River. There's even a Michelin starred restaurant in Amboise -- Le Choiseul. Bookings cancelled 60 days or more before the start of the stay will receive a 100% refund. Bookings cancelled 30 days or more before the start of the stay will receive a 50% refund.